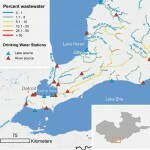 HydroSHEDS is a new hydrographic mapping product that provides river and watershed information for regional and global-scale applications in a consistent format. It offers a suite of geo-referenced data sets (vector and raster) at various scales, including river networks, watershed boundaries, drainage directions, and flow accumulations. HydroSHEDS is based on high-resolution elevation data obtained during a Space Shuttle flight for NASA’s Shuttle Radar Topography Mission (SRTM). A compendium of hydro-environmental attributes derived from existing global datasets and assigned to each river reach and each sub-basin of HydroSHEDS at 15 arc-second resolution. 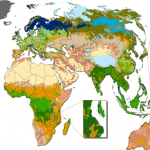 HydroATLAS is a comprehensive database gathering and presenting a wide range of hydro-environmental attributes from various sources in a consistent and organized manner. 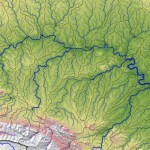 HydroATLAS is divided in two datasets, StreamATLAS and BasinATLAS, which represent the river network (lines) and sub-basin delineations (polygons), respectively. HydroATLAS datasets have the same cell size and extent as HydroSHEDS datasets, 15 arc-second resolution, and can be used in conjunction with them. Cumulative processes are important determinants of local conditions in river networks. HydroROUT is a set of simulation tools based on HydroSHEDS baseline data that provides routing, tracing and statistical processing within the river network to facilitate eco-hydrological modelling. The Global Reservoir and Dam database (GRanD) contains information regarding 6862 dams and their associated reservoirs, with a total storage capacity of 6197 km(3). 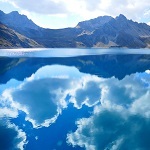 On the basis of these records, we estimate that about 16.7 million reservoirs larger than 0.01 ha – with a combined storage capacity of approximately 8070 km(3) – may exist worldwide, increasing Earth’s terrestrial surface water area by more than 305 000 km(2). We find that 7.6% of the world’s rivers with average flows above 1 cubic meter per second, are affected by a cumulative upstream reservoir capacity that exceeds 2% of their annual flow. Anthropogenic obstructions such as dams have been shown to decrease hydrological connectivity through barrier effects and to cause alterations of the natural flow, both of which are having very significant impacts on ecological integrity of rivers, wetlands and floodplains as well as on freshwater biodiversity. 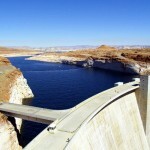 Using GranD and a set of future dams, we assess current and future legacies of dam construction. Thousands of industrial and natural chemical substances are released into the environment from household, industrial and agricultural sources, posing significant environmental challenges. We developed a new geospatial contaminant fate model capable of predicting chemical concentrations for a variety of substances from consumer products at scales and with a suitable accuracy to support screening and decision making. River type classifications can reveal the spatial and hydrological configuration of a river system and can serve as a first-order proxy for large-scale aquatic biodiversity patterns and their related aquatic ecosystem services. 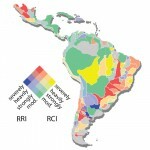 The Global River Classification framework (GloRiC) aims to create managable freshwater units based on hydrology, physiography and climate, and geomorphology, supported by expert assessment. 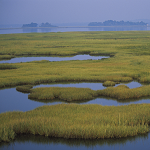 Temporarily or seasonally inundated habitats such as wetlands and floodplains are recognized as irreplaceable biodiversity hotspots. GIEMS-D15 represents water extent at three time scales, making it the first temporally explicit global map of surface water extent. 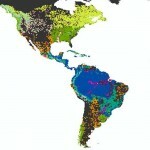 Global Lakes and Wetlands Database (GLWD) is the combination of the currently best available sources for lakes and wetlands on a global scale (1:1 to 1:3 million resolution). The application of Geographic Information System (GIS) functionality enabled the generation of a database which focuses in three coordinated levels on large lakes and reservoirs, smaller water bodies, and wetlands. 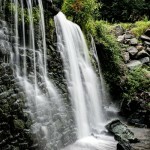 HydroFALLS is a global database of validated waterfall points with quality ratings. This product is the first of its kind in terms of scale and spatial coverage at the global scale. The database was created by means of the systematic merging, consolidation and validation of existing waterfall data sets to generate a waterfall point layer. The global river sediment load modeling project aims at developing and validating a global sediment model producing annual sediment load estimates. Direct sediment measurements taken at gauging stations worldwide are used for the validation phase of the project. Measured sediment data are collated from various published sources.